When you hear words like “big data” or “statistics,” you probably think of finances or high tech research. You probably don’t think of Major League Baseball. For decades, Wall Street and Silicon Valley have had the best pickings of super-smart graduates from elite schools. However, starting in the mid-1990’s, these graduates found a new home: professional sports. In the book, Moneyball, it describes how teams like the Oakland Athletics struggled to find great players. This is because many were selected by scouts and managers who were following more instinct and gut feel, than empirical evidence of skill. A tight budget as a small market team only made it harder. Because these teams couldn’t afford to pay for great players, they had to try something different to compete. Teams like the Athletics hired statisticians to find the most undervalued athletes to add to their team. Their plan was a success. After an 8 year drought, the Oakland Athletics made the playoffs in 4 straight seasons from 2000-2003. Seeing Oakland’s success, others quickly followed suit, most notably Theo Epstein. He was able to use the approaches to win 2 World Series championships with the Boston Red Sox, before moving on to the Chicago Cubs. In a previous post, we introduced Epstein, the architect of the Chicago Cubs’s World Series championship who focused on a healthy team culture. By the time Epstein moved to the Cubs, the Moneyball secrets that helped him win 2 World Series with the Red Sox had become popular industry-wide. So, he had to search for new competitive advantages. Ones that almost every team was too impatient to execute. That’s why he invested in having a healthy culture from the start. However, he didn’t stop there. “Fifteen years ago there weren’t that many teams specializing in the statistical model to succeed…Now the world is so flat — everyone’s doing that! Today, we take a look at how the Cubs invested in employee development plans for their players to help them win, and how others are doing the same. You can do this, too. You don’t run a professional sports team, but like Epstein, you want to win your version of the World Series. 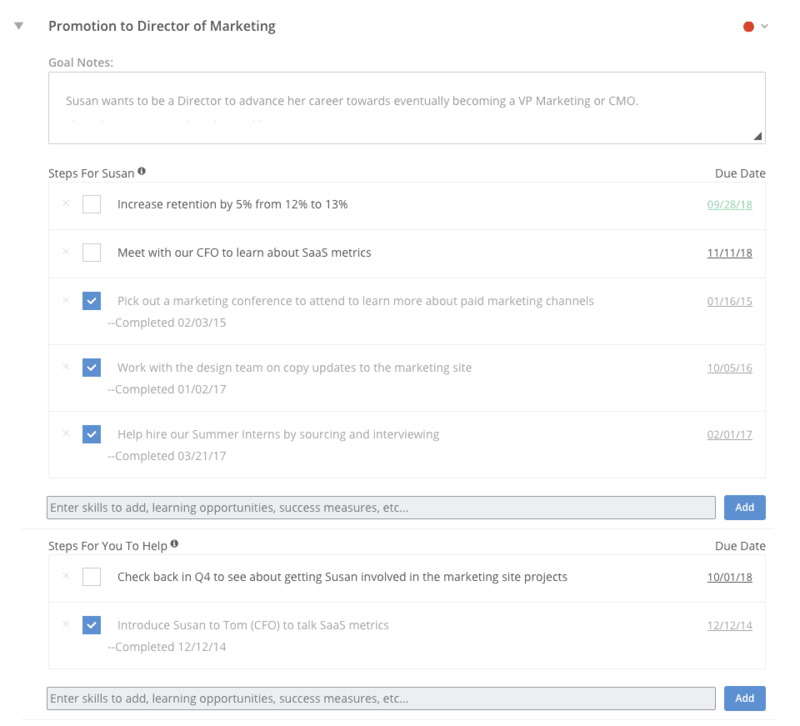 You may have a big event, an OKR, or big project you want to knock out of the park. However, dreams and reality can be different. Things can stall out. Your projects could be taking longer than expected to finish, your team may not seem engaged, or maybe you’re losing some good people on your team. This could be a sign that you should focus more on employee development. It’s really a win-win for you and them; they build new, valuable skills, and those skills help your team and company succeed. Yet, many miss out on those benefits because they do not take the time to invest in their people. Epstein had a long-term vision. Instead of competing with other teams for popular athletes, he selected talented, but underdeveloped players to invest in their growth. Although elite players have the most experience, they’re expensive, and can have attitudes and habits that work best for them, but not always for an entire team. To avoid this, Epstein wanted to find players that he could shape to work specifically for the Cubs. They would accept their advice and systems with little resistance. One of these systems was their Individual Player Development Plans. These plans were customized learning and action paths that helped players improve their skills and achieve goals specific to each individual player. Epstein created similar plans to the USA baseball ones pictured above. As important as the plans themselves was how they created and worked on them. They were a collaborative effort. Similar to 1-on-1s, Epstein met with each player privately to discuss them, and they would also meet with managers and coaches. This ensured everyone was on the same page, and working together towards the same goals. In these meetings, managers would review and discuss a player’s physical and mental strengths and weaknesses. “[We say], ‘Here’s what we see. Here’s what you need to work on to become a big leaguer. Here’s a plan to work on it.’ Then a player gets to give their feedback and give their input. They get to argue, ‘No, that’s actually not a weakness. I do that fine. Here are things I want to work on. And you see this transition. Their first year they’re just listening…But by the time they reach Double-A..they’re starting to take responsibility and accountability for their own development. When the sessions were over, both the managers and athletes signed and were given a copy of the plans. These customized plans showed that management cared about their employees’ future. It also gave them a clear path for how to improve and advance. A healthier farm system of talent for the Cubs was a win-win; more players growing, meant more talent for the major league roster, or for trades to improve the team. Meanwhile, as a player, they were likely to have longer, more lucrative careers by growing and improving. There’s a surprisingly large amount of data that shows that employees crave growth and development, yet aren’t getting it. In a Jumpstart: HR survey, job seekers from all employment status, gender, age, and educational background all wanted this from their employer: opportunities for growth and professional development. They even picked this over compensation and benefits. 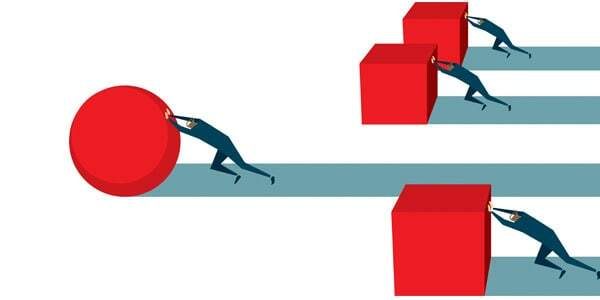 Like players, employees want to improve their skills and help their company win. However, Jumpstart’s report found that employee development programs tend to be the first area cut from a company’s budget. This has a very negative impact on your employees. They are less motivated to do their best work and are usually not satisfied with their job. Only 16% reported that they felt valued at their company, while only 22% would call it a “good place to work” compared to 80% when an employee felt supported by their supervisor. Not surprisingly, with these kinds of numbers, about half of those feeling unsupported planned to look for work elsewhere. 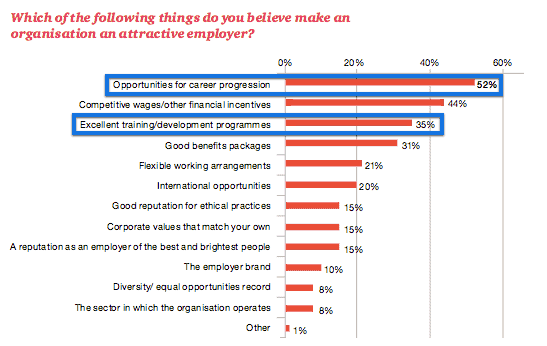 This is troubling because employee turnover is so costly (often 2/3rds of an annual salary). Your employees could be suffering from the same problem. 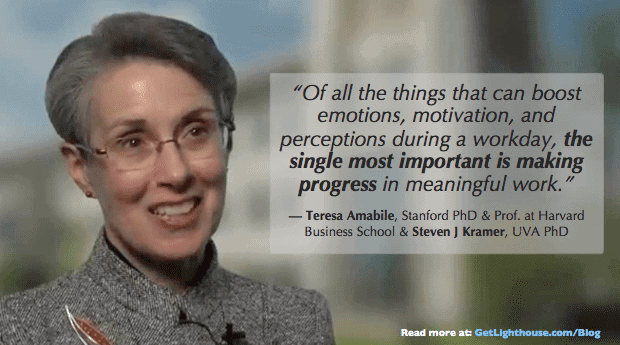 If they’re disengaged, it may be because they seek a more supportive leader at work. You can help them by creating employee development plans that fit their needs. As a manager, your employees look to you for guidance about their career. Help them out by asking them a few questions in their 1-on-1 meeting with you and helping create a plan. Identify Employee Goals – Discover what long-term goals that your employee has. Ask them how they currently see themselves in your company, and how they’ll like to see themselves in the future. Be Open and Listen Attentively – As humans, we make the mistake of centering our desires in conversations. Focus on listening to what they want. Assess Their Skills – What are their strengths? Their weaknesses? What are their current skills? When discussing their goals, consider what new skills and tactics they must develop to reach that goal and how you both view them currently. Give Feedback – Offer them honest feedback and suggestions on how they can improve. You should be the bridge between who they are now and who they can be in the future. 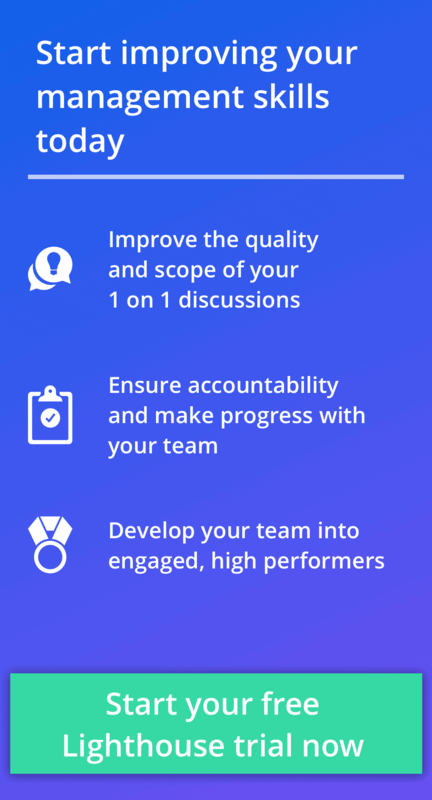 Your 1-on-1 meetings are great opportunities to have these discussions. You can then use the dedicated time to also talk about next steps to help them make progress in these areas, just like Epstein did with the Player Development Plans. Want a place to collaborate and stay organized on all your employee development plans, and your 1 on 1 discussions? Then sign up for a free trial of Lighthouse here. 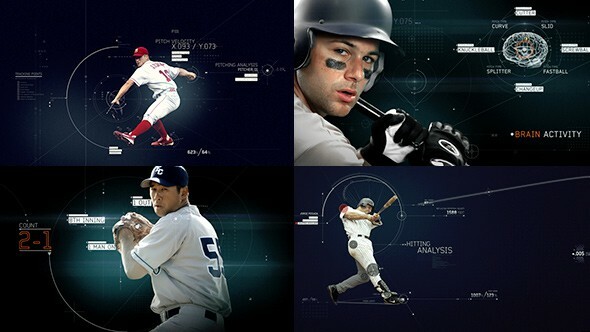 While with the Red Sox, Epstein was introduced to an innovative sports and tech company called NeuroScouting. NeuroScouting developed computer simulation games that evaluated a hitter’s hand-eye coordination and reaction times. These simulations could then predict the player’s performance under pressure. One of the games displayed baseballs coming at a hitter with the speed and spin of real major league pitches. Since you can’t swing a real bat, to hit the ball, the player hits the spacebar. To test this theory, he ordered all minor league to play the games for 15 minutes before taking field batting practice, three to four times a week. One player in particular who strongly benefited from this tech was Dexter Fowler, one of the best hitters in Cubs’ history. When he was about to face Indian’s pitcher Corey Kluber, Fowler would watch Kluber’s spin, speed, and path of his fastballs on his tablet. He repeatedly used NeuroScouting to learn how to hit Kluber’s pitches. “You see the exact pitch just as it would come at you. With a two-seamer, you’ll know exactly how fast it goes, what the spin looks like, how much it runs. Does it have some tilt? Is it flat? All this practice paid off in a big way for Fowler. In Game 7 of the Cubs-Indians World Series in 2016, Fowler led off the game with a home run against Kluber, the first ever leadoff home run in a Game 7. Flower’s use of NeuroScouting technology is just one example of a development activity that helped improve his baseball skills and was part of his Player Development Plan. While you probably don’t have a game your employees can play to hit fastballs, you can do the same by identifying activities that compliment your team’s core work that your employees can work on to build their skills. Without use or practice, skills lose their sharpness. That’s why investing in your team’s growth is so important; not only are you missing out on the potential gains from growth, but you’re also risking talent going to waste as skills atrophy. Today, medical and health professionals are experimenting with different forms of practice to keep their minds sharp. Researchers discovered that many undergraduate nursing students forgot what they learned within four to six weeks of leaving school. “The additive curriculum in both nursing and medicine results in a myriad of skills being ‘taught but forgotten’ very quickly. The ‘shotgun’ approach with emphasis on basic skill attainment and little attention to retention continues unabated. These medical hopefuls were experiencing a common phenomenon called the Ebbingaus forgetting curve. This curve approximates how quickly we often forget information. Only through repetition over time can this be overcome. 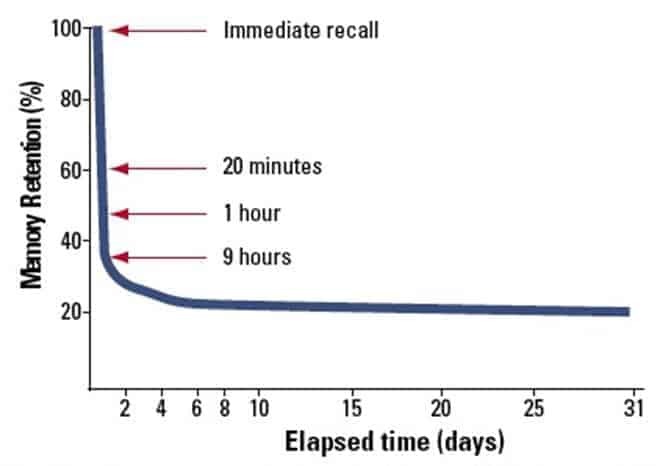 The graph below shows how even after just 20 minutes, our memory retention is already steeply dropping. After one day, we struggle to recall even a quarter of what we learned. It’s easy as a leader to undervalue repetition. Most leaders tend to offer initial help, and then they leave employees to fend for themselves with little followup. Unfortunately, because of the lack of true retention from repetition, the odds of mistakes happening are much greater. Northwestern University Internal Medicine and Emergency Medicine tried to address this in the academic article, Cost Savings From Reduced Catheter-Related Bloodstream Infection After Simulation-Based Education for Residents in a Medical Intensive Care Unit. 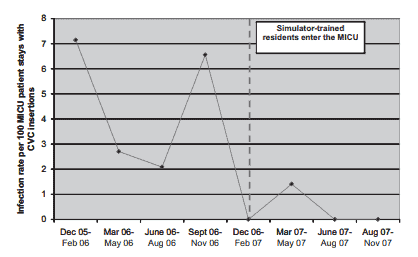 From December 2006 to November 2007, 69 internal and emergency residents completed a simulation-based education program before entering the Medical Intensive Care Unit (MICU). They attended lectures, finished ultrasound training, and practiced on a CVC simulator with the help of an instructor. This program resulted in improved trainee skill and reduced CVC insertion complications, including a significant decrease in catheter-related bloodstream infections (CRBSI). This graph depicts the rate of infections before and after the intervention. 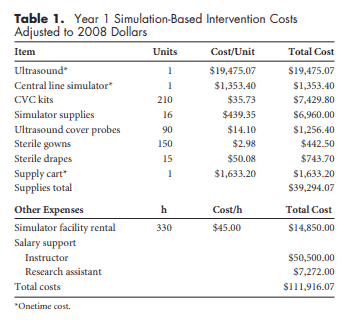 In this table, researchers calculated the total cost of running the simulation-based program in the first year. The total cost of the program was $111,916, while the predicted annual cost to continue the program was estimated to be a slightly lower $89,455. When compared to the cost savings, this proved to be a huge success. There were major cost savings to the hospital due to preventing infections before they began. Thanks to the improved work from better training leading to fewer mistakes, over $815,950 was saved – nearly 8 times higher than the program cost. This experiment, in a high stakes health care environment no less, shows that investing in employee development can be very rewarding. Not only did the simulation save patients from infections, but it also saved the university almost a million dollars a year. You probably don’t need a simulation or game to get the best out your staff and help them grow. What you do need is to work with them to select development activities that work best in your situation. Working off a list like this, you can pick out the best approaches for each person’s skill set you’re looking to develop. Choose a metric for success – Choose a metric that best measures the effectiveness of the activity. You need to know if an approach is working or not. The Chicago Cubs used the batting performance of players to judge the performance of NeuroScouting. Hold them accountable – As a manager, it’s your responsibility to make these activities accessible, whether by approving work, making a needed purchase, or facilitating connections. However, ultimately, it’s your employee’s job to complete the activities. They need to “own” their career development. Make it a habit – Learning needs to happen on a consistent basis, because skills tend to stagnate if they’re not used. By regularly checking in on progress and planning new activities that build on previous ones, you’ll create the best outcomes. Epstein started his plan to turn the Cubs around by focusing on building a culture around empathy. With the right cultural foundation he then added a focus on employee development plans that then took a good team and made them champions. 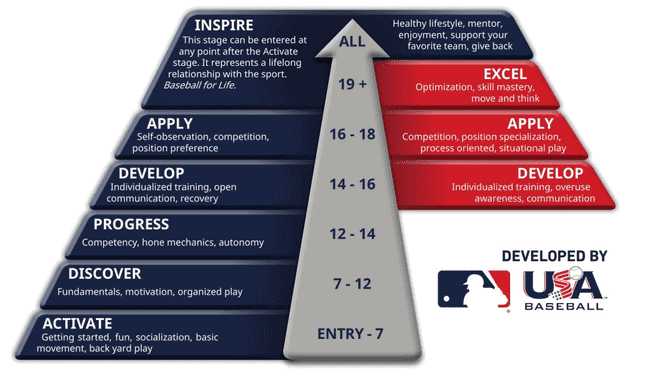 He created Individual Player Development Plans to help athletes improve their skills and learn feedback. A process that too many managers let slip but should absolutely make the time for. 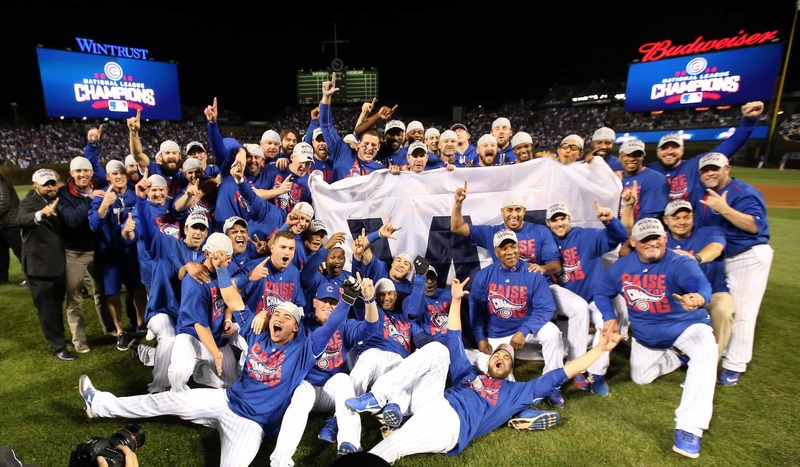 To be like Epstein and the Cubs, hire a team with good people you enjoy working with, and then help them grow. When you do this, you’ll save money on costly turnover with your team, and more importantly, experience the gains of a leveled up, experienced staff working hard toward your company’s goals. Investing in creating employee development plans is an easy win-win for you and your team. Why not start helping them grow today? Learn how to start a discussion with your team about their career goals here. Here’s what to do if your employee is unsure of their career goals. Can’t promote people? No problem. Here’s a variety of ideas for how to provide employee development without promotions. 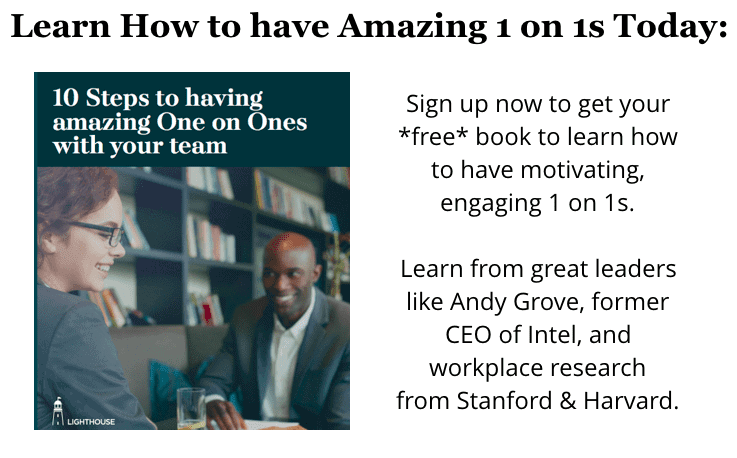 And if you want a great place to stay organized on the employee development plans you create with them, and more tips for things to check in on in your 1 on 1s, sign up for a free trial of Lighthouse here.